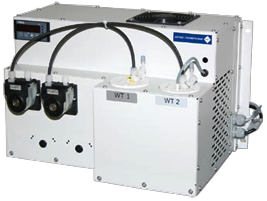 The Sample Gas Cooler is designed to lower the sample dew point and separate water vapor from humid sample streams in gas analysis systems. A typical application is to provide and maintain a conditioned gas sample prior to gas analysis by moisture intolerant analysis equipment. To achieve a stable dew-point at varying inlet conditions, an improved proportional temperature controller and a high performance heat exchanger have been designed. 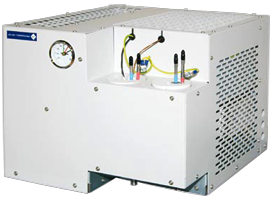 The cooling system features a continuously running non-CFC compressor motor filled with environmentally friendly R134a. The heat exchanger is built into analuminum cylinder, which absorbs peak loads and utilises maximum heat transfer rate and guarantees leak free operation. A built-in condensate discharge pump removes the condensate continuously.